Bolton 66 at the Pleasure Beach in Blackpool on Illumination Tour duties on 13 September 2002. Bolton 66 was the first 'foreign' tram to operate in Blackpool. At the start of the 1980s with the Tramway's centenary approaching Councillor Parkinson, the Chairman of the Transport Committee, suggested that trams should be used from other towns and cities across the country. Bolton 66 was the first of these trams and arrived in 1981 follwing completion of its restoration, and it remains in Blackpool today 22 years later. The tram is an unvestibuled 8 wheel double-decker which was built by the Electri Railway and Tramway Carriage Company in 1901. The tram was originally an open-topper but was enclosed in 1932 although it retained an open drivers platform. In 1940 66 was renumbered 366 and was seen on Bolton-Dunscar and to Farnworth and Westhoughton services. 366 was withdrawn from service in 1946 and the lower saloon was sold as a caravan. It was rescued by local enthusiasts in 1964 and after the restoration (including the building of a completely new top deck)and testing at Kearsley Power Station the tram arrived in Blackpool on 23 June 1981 where it has operated ever since. 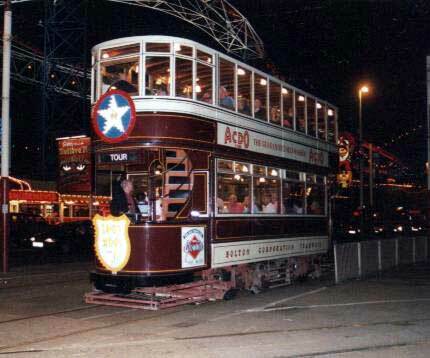 Since the tram has been in Blackpool it has been fitted with a low voltage lighting system and air brakes.